Image via CrunchBaseAt the rate that Friendfeed are updating with new features I may as well create a seperate blog to run along side this one. Just so that I can keep you up to date with the latest news and offerings from the development team. Friendfeed have now also introduced Friendfeed IM [Instant Messenger] currently compatible with Google Talk and Jabber. By configuring our Account settings we can send an IM when someone comments on our posts or send an IM when there is activity on one of our lists which can be further configured for posts only, posts and comments from friends or posts and all comments. Allowing us to choose how noisy we want this to be and it works simple and efficiently. Once you have enabled IM notifications, you can also post messages and comments to your FriendFeed by sending IM commands to the FriendFeed bot. FriendFeed assigns a number to each entry when it's sent to you. You can use this number to comment on or like the entry. 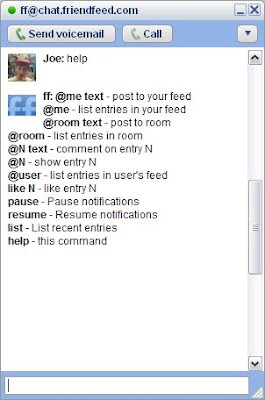 See the commands below for some examples. Comment on entry N. When you receive entry and comment notifications via IM, they are all prefixed with @N. You can reply to them by prefixing your comment with the same @N.
Show entry N. Useful when you get a comment on @N and you want to see the original post. As you would expect from Friendfeed all of these updates work really well, the site continues to become a central information social hub. With the 48 services available the site leverages all of our content and makes it available in one place. Interaction is what it's all about and Friendfeed makes it ever easier to jump in and get involved.